These wine preservers keep vino tasting fresh until you finish the bottle—up to weeks (or even months) after you open it. Each one-time-use smart stopper contains oxygen-absorbing materials that will make sure every glass is as good as the first. Dimensions: 6" x 1.3" x 2.4"
I gave this to my daughter, don't know if she's used it yet. Both recipients like their Repour gift and can not wait to put them to use. Have already used some of these and they work like a charm! Our resident wine expert had never seen them and even he was impressed. Works as advertised, love them. These wine preservers can keep an open bottle fresh for weeks—or longer. You might not know that oxidation is the culprit that robs wine of taste once the bottle is open. 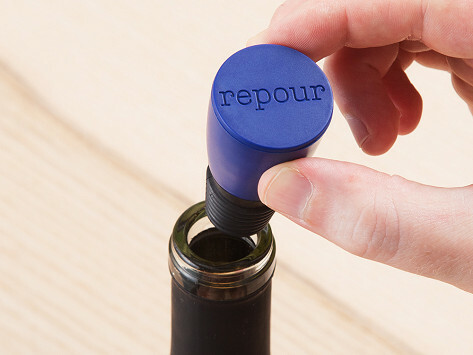 Each Repour is one-time-use smart stopper that effectively blocks out air, preserving your vintage in a drinkable state. Chemist (and wine lover) Tom Lutz created Repour to make a bottle’s last glass taste as good as the first. It’s Made in the USA and contains oxygen-absorbing materials that remove oxygen from the bottle and the wine itself, too. 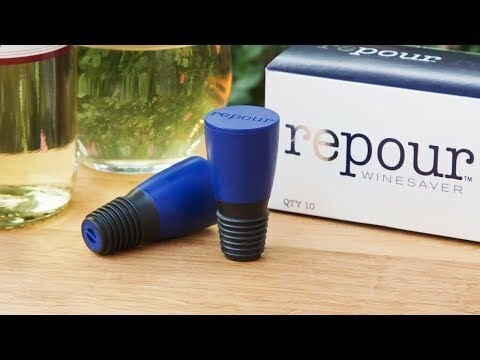 With Repour in place of a standard cork, you can save a full bottle of wine, even if you’re only drinking a glass at a time over days, weeks, or months. Now there’s no pressure to finish a bottle or toss it—it’s patiently waiting for you.